The WC-Co (Carbide) is the generic name for certain metal that is combined with a tungsten carbide (WC) and a cobalt (Co) which is a binder and sinters at a high temperature and produced. Generally, it is considered to have the hardness next to the diamond, but it can be changed the ratio of WC and Co depending on some usages and can be changed the characteristic. It can be changed a characteristic by adding Ni or the Cr, and the materials manufacturer develops various types of WC-Co (Carbide). The WC-Co (Carbide) without Co is also developed. 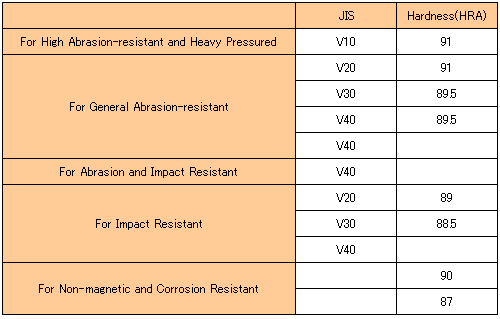 The WC-Co (Carbide) is mainly used as materials of a field required the abrasion resistance and the impact resistance characteristics such as a cutting tool or the die. We would choose any type of WC-Co (carbide) depending on the specifications of the customer. Siburan Company (now is Toshiba Company) And Tokyo Denki Company is the first company in Japan to development Tungsten Carbide. By changing a particle size and quantity of Co, its hardness could be settled as sticky super hard. The emeritus professor at Osaka University Kozo Osakada stated as follows. “The WC-Co (Carbide) was developed as the materials for the drawing dies. It is not clear that when is the beginning age to use the WC-Co (Carbide) to the cold forging, but it is thought that it was used from very begining (about the year 1940) of developping the cold forging in Germany. Above tendency is remarkable in the cold heading process, and there comes to a certain assessment that the WC-Co (carbide) is absolutely indispensable. Among the heading dies producing in us, we would explain the three typical structure of dies and the manufacturing method of them. 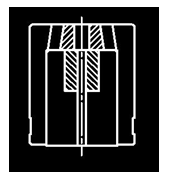 Usually, the heading dies has the structure of the WC-Co (Carbide) with the dies steel which reinforcing the WC-Co(Carbide). Since the WC-Co (Carbide) is bristtle materials and very expensive, all dies might not be made of the WC-Co (Carbide). Then, we would do the hole processing with the small hole electric discharge machining, the wire cut electric discharge machining and the sinker electric discharge machining to the WC-Co (Carbide) part. This part becomes the core where, actually, is used for the component production. Therefore, we finish it in a mirror surface condition by the lap processing in the hole inside. Depending on its quality, the life-time of the die could be changed several times more. Even if it is said that the lap processing records life on a die, that is no exaggeration. When we design the heading dies and punch, if in the case of its shape could be breakable due to the load is concentrated. or in the case of the expected shape could not be provide due to the air or the oil collected to draw out the material, we would be able to solve those problems by dividing the inside of the heading dies inside. In addition, we would be able to plan cost reduction by making the structure that can change only the portion of the WC-Co (Carbide) where wearing out. We call the assembled dies that comprised of such a plural materials in us. What kind of die structure we take is the capability that is tested asr the die manufacturer is tested. As for the Integral custructioned shape with the pin and the folder, the stress is concentrated at the root of the pin. Then the die might be disrupted on that area. The tungsten carbide two-piece punch is suitable for mass production of stainless hexalobular shape head screw which could prevent very strong stress to the dies. Because the hexalobular shape head, not like plus or minus shape, is very difficult to form due to unique shape of hexalobular. And it would exercise its performance for mass production of such a complexed shape as a result. In general the HSS all-in-one punch is used for that production, but the life-time of the dies goes short. On the other hand the life-time of the tungsten carbide two-piece punch would be 15 times to 30 times than HSS one and even if a pin is worn, you will be able to sharpen it again and reuse it. When there is gap between a pin and the folder at the time of header processing, the burr might come out to a product. In order to solve that problem, after having produced pins, we measure the shape of pin by the 3D measuring device and produce folders based on the data. Because we would be able to suppress the gap to around several μm, any burr do not occur.